Increasing awareness of operator health and safety responsibilities and the reinstatement costs to accidentally damaged buried services is driving the demand for higher standards of equipment performance and reliability in ever more crowded situations. 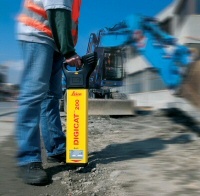 Leica DigiCatTM 200 has been introduced in 2005 to the Leica DigiSystem family to meet this demand. The upgraded new model provides - in cooperation with the Leica DigiTex 8/33 signal generator operating in 33 KHz mode - the real depth and location of all services. Leica DigiCatTM 200 enables reliable plan position pinpointing and depth estimation to 3m or 10 ft and an accuracy of approx. ± 10%, and gives full 3D location of buried services. When used as a safety tool, locating hazardous and life threatening buried services, operator error is a real threat to safe operation. Leica DIGICAT 200 available from Merlin Lazer Ltd automatically starts in the power mode and sets maximum detection sensitivity for a “Safety first” approach. The success of active signal tracing, using Leica DIGICAT 200 in conjunction with Leica DigiTex Transmitter depends on variable site conditions such as external interference signals - traffic loops or tracing in congested areas - with many buried services. Leica DigiCatTM 200 can be set to trace either an 8 or 33 KHZ tracing signal and gets the best results for the specific site conditions. Working in busy construction sites presents a personal hazard to construction workers who must use both their eyes and ears to ensure personal safety. Leica DigiCatTM 200 has both visual and audio indicators to provide the safest indication to the operator when working in adverse conditions. As part of a safe system of work for general construction activities, detection and avoidance of existing buried services form an essential step before excavation can begin in a safe manner. The Leica DIGICAT 200 passive signal POWER and RADIO modes provide a reliable detection means for buried services naturally carrying these signals. With close to 200 years of pioneering solutions to measure the world, Leica Geosystems products and services are trusted by professionals worldwide to help them capture, analyze, and present spatial information. Leica Geosystems is best known for its broad array of products that capture accurately, model quickly, analyze easily, and visualize and present spatial information all available from Merlin Lazer Ltd.
Those who use Leica products every day trust them for their dependability, the value they deliver, and the superior customer support. Based in Heerbrugg, Switzerland, Leica Geosystems is a global company with tens of thousands of customers supported by more than 2,400 employees in 22 countries and hundreds of partners located in more than 120 countries around the world. Leica Geosystems is part of the Hexagon Group.